The first thing that springs to mind when listening to Tomb Mold’s The Bottomless Perdition / The Moulting is that it must be a re-release of some early Death Metal material from the 1980s or early 1990s. One of those bands who released a few tapes back in the day, but never quite made it to a wider audience. The most obvious reference point may be early Grave and the music here is very similar in style to the raw sound of Into The Grave. 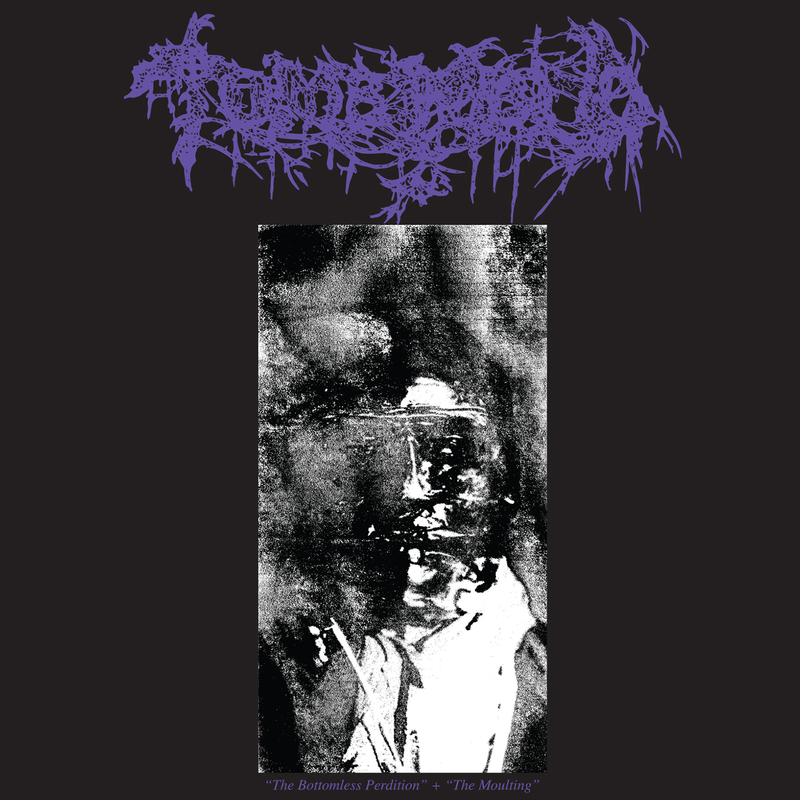 The Bottomless Perdition / The Moulting is, as predicted, a new release of earlier material, but that material consist of a couple of demos dating right back to …. 2016. Surprisingly, Tomb Mold appears to be a new band, although there is precious little information available about them. Two reviews on The Metal Observer in one year may be unprecedented, but Tomb Mold have already been reviewed on the site in 2017, with new album Primordial Malignity scoring more highly than this one. First track “Demon Ruins” starts on a strong footing, with catchy riffing, some great, albeit brief, guitar leads and a pleasantly varied rhythm section. It’s a good Death Metal track, but unfortunately Tomb Mold never quite match it on the rest of this release. There are fairly enjoyable tracks, such as the instrumental “The Moulting”, which has nice, slightly eerie-sounding guitar leads and a rhythm section that sounds similar to early Acheron. “Vehement Indulgences” has plenty of variety and is one of the better tracks, although not reaching the standard set by the opening number. Elsewhere there are catchy riffs, good lead guitar work and even a solo with a bluesy edge to it on “The Bottomless Perdition”. Tomb Mold have also done a great job of capturing that dark, recorded-in-the-back-of-a-cave sound from the early days of Death Metal. However, the songs themselves often slip into the mediocre range and never reach the heights set at the start. The critical acclaim for Primordial Malignity suggests that the band may be moving in the right direction and this re-release of earlier material may be just for completists. This entry was posted in Death Metal, Reviews and tagged Acheron, Blood Harvest, canada, Death Metal, Grave, Into The Grave, The Bottomless Perdition / The Moulting, Tomb Mold, toronto.